We’ve just launched 3 fabulous NEW products to our frozen loose-serve vegetable mix range. A rustic collection of diced tomatoes, courgettes, aubergine, mixed peppers with sliced onion. Great for ratatouille, casseroles, soups and more! 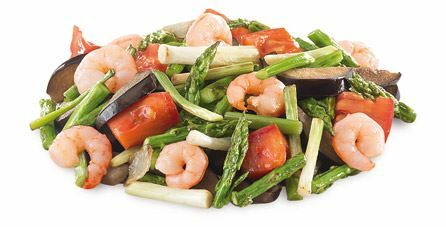 A delicious vegetable medley of grilled aubergine, tender asparagus, garlic, diced tomatoes and white onion with peeled raw plump prawns. Ready to stir fry. Delicately spiced white rice with cauliflower florets, sweet potatoes, butternut squash, red peppers, red onions and spinach leaf. A classic Indian dish! All have been frozen at the peak of freshness ensuring the quality, nutrients and freshness of the foods are locked in. All 3 new vegetable mixes are sold straight from the freezer in a scoop-and-serve format and can be bought in customers’ own reusable tubs or bought in a single recyclable bag. A significant way to reduce unnecessary packaging waste. Customers can buy as much or as little as they need and store it at home in their freezer until required; reducing any unnecessary food waste too. Look out for them in your local farm shop.